Appearance: (6) A little dark, but maybe it was the lighting? One reviewer thought that the jalapenos were a little wan, the other thought that they looked fine. While multicolored chips were used, they were mostly blue, adding to the dark appearance. Despite us having requested them, neither guacamole nor salsa were provided, which knocked the brightness down by a few notches. Quality of Ingredients: (6) Smashley repeatedly contended that the cheese was very good. We also appreciated the inclusion of black beans, always a plus. The chips were homemade but on the greasy side, and chicken, while lacking in flavor, was perfectly moist. Distribution of Toppings: (4) While the cheese was well-melted, in quickly congealed upon reaching the table, and tended to slide off of the chips when we pulled them out. 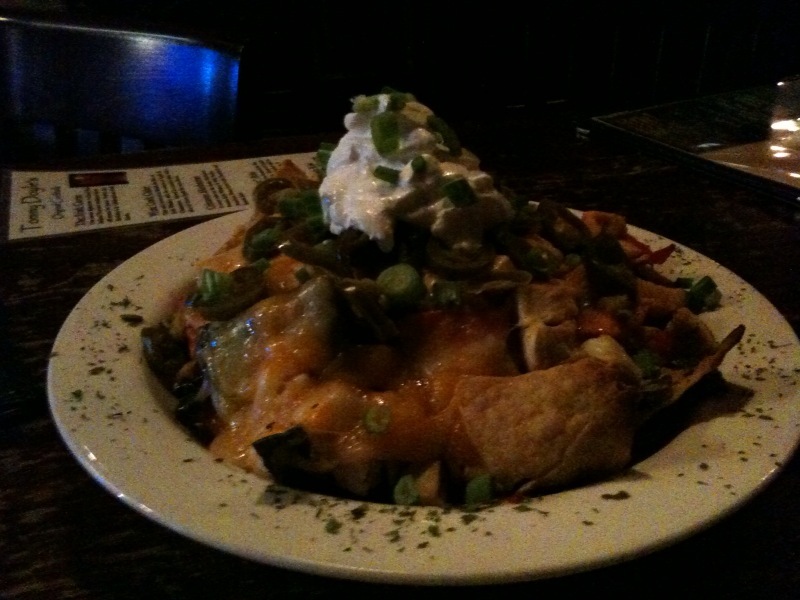 As a result, without the mortar of melted cheese, the other toppings refused to adhere to the chips as well, making for a frustrating nacho experience. The hat of sour cream became oppressive and hard to get past to reach the toppings. Price: (7) With chicken, $10, which is nothing exceptional. Overall: 23. Our quest for good nachos in Harvard Square presses on!